12-month supply $299.99 Save Over 50%! It is important for men to support their prostate health as they age. Healthy Prostate was designed to support and promote prostate health along with working to reduce symptoms associated with a swollen prostate. Healthy Prostate combines 8 ingredients to tackle numerous threats to prostate health. DIRECTIONS Adults take 2 capsules daily or as directed by a health care practitioner. Do not use if seal around cap is broken. Hi, I have been taking Healthy Prostate and I feel it helps reduce my urgent trips to the bathroom. It helps me be able to sleep better at night, compared to when I don't take it. I use Healthy Prostate and it helps me sleep better through the night without having to get up as much to pee. Love your products. I had tried other products but they were giving me side effects. I feel amazing after using Healthy Prostate so far, and am very satisfied. Love the ingredients compared to other products on the market. Plan to continue taking the product, helps me get a good nights sleep. I am a 82 years old and have been a regular customer for the last three years. Your Healthy Prostate product has helped support my prostate health, while being well tolerate. 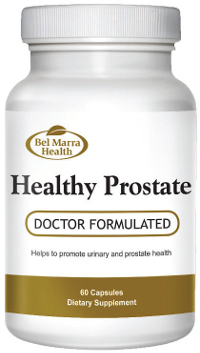 Regarding Bel Marra's Healthy Prostate supplement I gave been taking for 6 months. I find them very, very good. It has helped support my prostate health and reduce nighttime urination.